This morning, after I finished morning report with my medical students, I walked outside and was approached by a stranger. He was a man about my age who addressed me in decent French. “I want to ask you something.” Hmm, these conversations usually don’t go well. I don’t recognize this man, and the odds that I’m the person to help him are slim. Often, this situation is where someone with some education chooses to approach me randomly in order to try and get some special treatment, which is something that I’m neither in favor of nor very good at effecting, even if I wanted to. I try to not let my frustration at this interruption show. He starts to tell me that his pregnant wife was seen by Rachel for a problem with her placenta. That she had an appointment for Monday, but was told to come back sooner if something went wrong. She’s about 30 weeks along, and she started having contractions last night, so they came to the hospital. Rachel’s not at the hospital today, but one of our Burundian partner doctors is on the maternity service. I tell this guy that this doctor will see his wife shortly, and he will decide what is necessary. He seems OK with this. As he leaves, I examine my own frustration. I guess, in the end, he was just looking to take care of his wife by making sure Rachel was informed, and he incorrectly assumed that I was the best route for this. However, he seemed willing to be redirected. I hope that my annoyances didn’t show, and that he overall felt like I had responded in a caring fashion. A few hours later, I pass the hospital canteen, walking with a student to go and get the ECG machine. The husband is sitting on the half-wall that separates the sidewalk from the canteen veranda. I think about greeting him, but I don’t really want to be seen as the point of connection for him, so I walk by without saying anything. He didn’t seem to notice me. One hour after that, I’m getting ready to go home for lunch. I notice one of our medical students crying in the arms of another student, which is a notably public display of emotion in this normally stoic culture. When I come home, I ask Rachel how her morning was. She tells me that the wife did deliver prematurely, a little baby about 1.5kg, which hopefully will be big enough to survive in our NICU. Then, while they were working on delivering her placenta, her blood pressure dropped out, and she was struggling to breathe. At this point, they did call Rachel to come in, and she ran to the hospital, only to find that she had died. We don’t know why. The blood loss doesn’t explain it. In the end, we can formulate hypotheses, but we can’t think of anything we could have done to prevent such a death. But she’s gone. Unexpected interruption. Peevish emotions. Controlled response. Maybe kind? Early birth. Gentle hope. Shocking tragedy. Among other things, I continue to replay my little conversation with the husband in my mind. His world has been so changed today that I’m probably the last thing he’s thinking about. Yet it feels important to me that I treated him kindly, that my little role expressed somehow that God loves him and cares for him. That though God has given him a world that has devastated him today, that hope hasn’t disappeared forever. That though his baby will never know his mother, he might still grow up to be a joy for him. That death will not be the final word. I’m quite sure that my conversation didn’t communicate all that, but it’s what I find myself desperately wanting to say. I wonder if I’ll think about this the next time that someone interrupts me with a random request. At the end of the day, I’m walking out of the hospital, along the little concrete retaining wall next to the dirt road. It’s pretty quiet, and a group of boys are running laps in the soccer field in front of the church. I haven’t seen the husband. Maybe he’s gone. Maybe he’s with the baby. We must be awfully small, and not as strong as we think we are. When people ask me what I miss about living in a developed country, my answer is usually: restaurants. I love going out, looking at menus, visiting local dives, trying new things, sitting in coffee shops. I love traveling to new places by soaking in the atmosphere of a restaurant – the lighting, the music, the smells, the sounds of sizzling coming from the kitchen. And ok, I’ll admit it, I like going out because it means I am not cooking or doing dishes! I finish my meal and someone magically whisks away the dirty dishes and I enjoy a cup of coffee and possibly a yummy dessert. Going out to eat has always been a treat, but since living in rural Burundi for almost a year, I have really come to appreciate the luxury of restaurants! So what DO we do for meals here at Kibuye? Without restaurants or any prepackaged, frozen, or boxed food options, planning ahead is a must for every meal. I am definitely not a chef, but I have learned so much about cooking – and life in general – from the other women on our compound. With limited ingredients available locally, these women amaze me in their creativity and “can do” attitudes! What they can prepare, some days without electricity or running water, is inspiring. We all hail from different parts of the US, Canada, or UK, so each of us have different dishes that we cook to make our homes feel like “home”. For me it’s cornbread in a cast iron skillet when I’m homesick. For Lindsay it’s the days-long process of making sauerkraut. Even with our different “specialties” and “go to” dishes, we all use the same basic ingredients, so there are some similarities in our weekly menus. Breakfasts are usually oatmeal or zucchini bread, eggs and whatever type of fruit is in season. Bananas are plentiful and always a favorite! 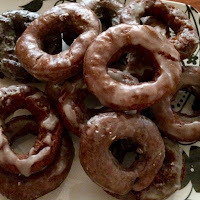 Very rarely someone will make a treat like donuts on a weekend, but ohhhhh, there is nothing better than biting into a piping hot homemade donut! Unfortunately (or fortunately?) they are very time consuming to make, so for the most part – we try and keep it simple. All the Kibuye families seem to have the staple “rice and beans” at least one day per week. There is one type of bean produced locally and we all buy about 1 kilo dried beans every week. The dusty beans must be carefully inspected by hand before soaking because the bag is peppered with sticks, rocks, dirt and little bugs who love to burrow inside the beans. But they are very affordable, as is the rice. Many families have a big batch on hand not only for their family, but also to help feed the Burundian househelpers, gardeners, and night guards who help us with everyday life. Another dish that appears almost weekly in most of our kitchens is pizza! Pizza has always been a favorite of mine. But I must admit I liked it because it was so easy. I could order right from my phone, wait about 40 minutes for the doorbell to ring, serve it on paper plates, and voila! Easy delicious meal with no clean-up! Here in Burundi, “pizza night” is still just as fun, but it is anything but easy. If you have ever made your own pizza dough, you know it must rise, be rolled out, and placed on a carefully prepared pan. None of us have pizza stones, so most pizza at Kibuye is baked on a rectangular cookie sheet. We make our own pizza sauce from tomatoes grown locally, but Italian seasoning is not something you can buy here, so we have all packed some in our suitcases (or asked visitors to bring some with them!). We can purchase only one type of cheese in a shop about 30 minutes away. It is generic in its flavor, probably best described as a cousin to Colby or perhaps a very mild cheddar. So it’s not exactly mozzarella, but it’s our only option, and it works for us! Popular pizza toppings among the families are green bell peppers, onions, pineapple, and sometimes imported canned mushrooms or olives. Pepperoni is a rare treat from America that gets used only for special occasions! All meat, for that matter, is sort of a “special occasion” thing. 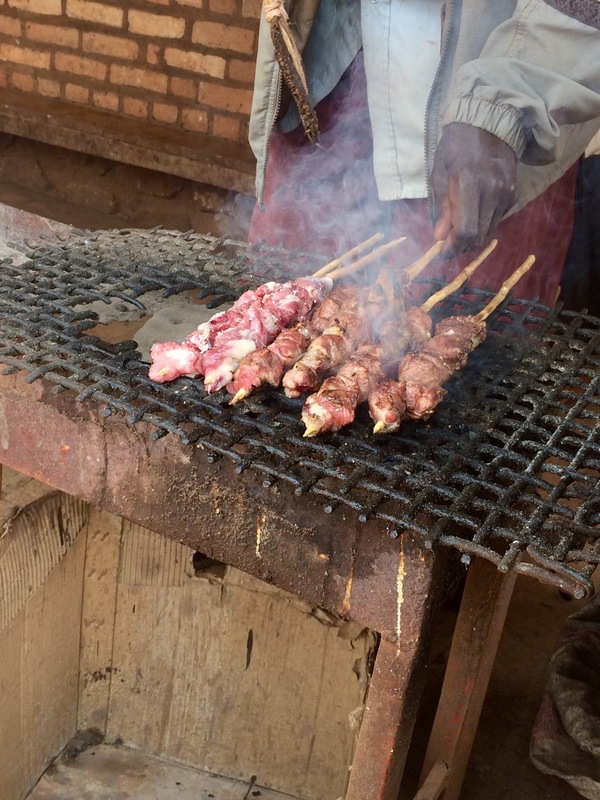 There is a boucherie (butcher shop) about three hours away in the capital city, Bujumbura, but getting meat up the hill to us is no small feat. Someone from our team goes to Bujumbura at least once a month, and they may go by the boucherie, but there are many obstacles. The shop is not open on Sundays, and we tend to go to Bujumbura on the weekends. When we do buy meat, we put it in a freezer bag, which sits in a hot car for a few hours driving up the hill. We must put it in the freezer the moment we arrive at Kibuye, but often our refrigerators are without power for 12+ hours, so the meat may not sufficiently freeze quickly enough. I have unfortunately thrown out more precious meat than I would like to admit, so we have learned not to buy that much, and don’t depend on having meat a lot. The whole compound is either full-time or part-time vegetarians, by necessity if not by choice. We make sure our families are getting protein from non-meat sources, but this highlights one of many reasons there is so much malnutrition in Burundi. If our families, who have refrigerators, electricity, cars, and money, struggle to get protein into our diets, imagine how much more difficult it is for the average Burundian to incorporate meat into theirs! Some Burundians might periodically buy a goat kebab, or brochette, sold at a local stand in our village. They are really tasty, and it’s fun to watch them cook, but you need to buy them on the right day, at the right time, if you want good meat! Some days I can allow my mind to drift away to large grocery stores and cool restaurants. I can even feel sorry for myself at times that I don’t have everything at my fingertips like I used to. And yet, when I look around me, it seems almost ridiculous the amount and variety of food that I do eat here compared to the Burundians we see every day. It is a paradox. In some ways we feel like we “do without”, but we know we also have much more than is necessary. So this is what we grapple with. Even food reveals our sin nature. But we carry on, being thankful for what we have and letting ourselves splurge on occasion without guilt. We appreciate your prayers as we daily face the severe poverty around us, wanting to help, but wanting even more to help empower the future leaders of this nation to care for their own. Pray for our families. Pray that our homes and dinner tables will be places of peace, laughter, and thankfulness. And if you ever come visit us in Burundi, you will have the opportunity to taste African rice and beans and goat brochette from the village, but you may also be surprised by the culinary creations you will find in any of our homes! During our time in language school, each semester we were asked to research and present an “exposé” on a subject of our choosing (in French, of course). One of my classmates, a surgeon heading to Togo, gave a presentation entitled “Africa Is Not Poor”. His presentation was based on a recent report which explored the movement of wealth into and out of Africa (specifically Sub-Saharan Africa) each year. The results were surprising. Despite the billions of dollars flowing into Africa each year in the form of aid, grants, loans and investments, the net outflow is considerably more, an estimated 41.3 billion dollars annually. While so many people living in Africa remain trapped in poverty, we need to remain cognizant of the fact that Africa is in many ways rich: rich in potential mineral resources, biodiversity, business, music, art, and of course rich in people who are strong and intelligent and capable of achieving great things, if given the opportunity to develop these gifts. Yet much of Africa has been and continues to be exploited by foreign powers. For many years this occurred in the form of colonialism. More recently this exploitation tends to occur through multinational corporations in the form of tax dodging, exportation of commodities, illegal logging and fishing and a myriad of other mechanisms. This is without a doubt a complicated problem, and I certainly don’t claim to have the answers to this problem. Furthermore, I don’t want to suggest that the answer is cutting off investment in Africa. I think investment in Africa is a positive step. But I do believe that the world needs to look more carefully at how that investment is taking place, and if the practices in place now are truly fair and just. The article outlines nine policies that it suggests are needed to reverse these resource outflows, including enabling transparent and responsible lending, elimination of companies exploiting tax havens, and a transformation of how aid is delivered and used in Sub-Saharan Africa. How can we, a team of missionary physicians serving in a rural hospital in Burundi work for transformation of this global injustice? To be certain, while our sphere of influence is limited, one does exist. We have influence in the lives of our students, who we hope will become the next generation of African physicians and community leaders in Burundi and it’s neighboring countries. These East African students can be empowered to understand practices and policies that will lead to greater equity for THEIR people, not just equity of healthcare but equity of investment and aid and human rights. How can one teach and empower another people group to understand and work toward justice? I believe that one needs to see justice from the eyes of our Creator. And in order to have hope, one needs to have confidence that He cares about every form of injustice on this earth. We as a team believe that it is through the power of the Gospel, that this deeper understanding of justice is revealed. And so we are working not just to teach medicine, but to come alongside our African partners as they seek answers to much bigger questions. As we see the massive importance of justice to our Creator, and the massive role that justice played in our redemption through Christ our Savoir, we are transformed and empowered to see, to understand and to respond. Transformation is possible. Indeed, all things are possible with God.